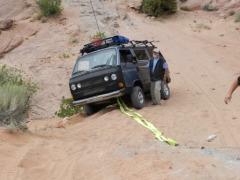 Syncro Solstice Moab Hells Revenge. Camera angle off, much more of an angle then it looks like! Update I now have a winch 8500 LBS. Now I will not have to use a Jeep to get me out!